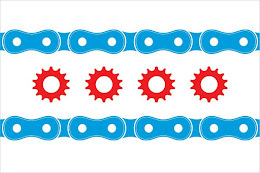 The Illinois Bicycle Lawyers have been retained to represent a Chicago bicyclist who was severely injured in a bicycle accident on August 29, 2012. The bike accident occurred at the intersection of Halsted and Chicago at approximately 4:20 p.m. The bicyclist was traveling northbound on Halsted in the dedicated bike lane that runs on both sides of Halsted. The bicyclist had come to a complete stop when the traffic signal on Chicago turned to red. The bicyclist appropriately waited for the light to turn green and only then entered the intersection. However, at the same time that the bicyclist entered the intersection on the green light, the motorist disregarded their red light and entered the intersection. The motorist directly hit the bicyclist in the center of Halsted and Chicago. As a result of the collision the bicyclist suffered a fractured leg, severe road rash to the face, and numerous related lacerations and bruises. After the bike accident, the bicyclist was taken by the Chicago Fire Department to the hospital where he was treated for his injuries.